Sam Navarro set out to create his first ever Custom Car. 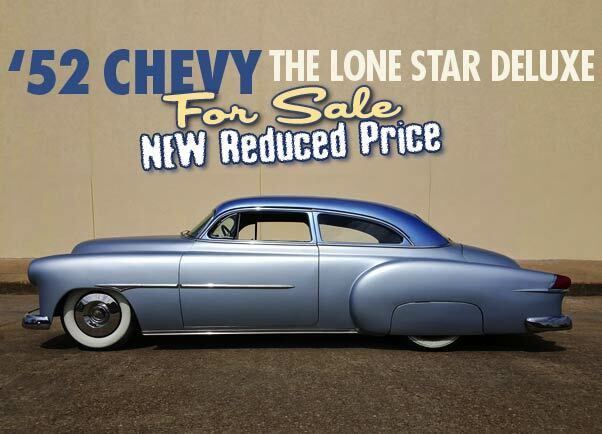 Inspired by the Larry Ernst and Leon Welmas Chevies he created the wonderful 1952 Chevy The Lone Star Deluxe. In 2009 Sam Navarro’s life was calming down after some turbulent years and he decided it was time for him to start his first Custom Car. At first he was not quite sure what car he wanted to start with, but when Richard Donham “Burl” from Los CoChinos car club offered a decent looking in progress 1952 Chevy Styleline Deluxe for sale he decided to pull the trigger and this would be his Custom Car Project for the next couple of years. Sam realized the 49-52 Chevies have great potential as classic looking Custom, no matter which body style you choose. There where plenty of historic samples that would provide the much needed inspiration for his project. After looking at hundreds of photos of the 1949-52 Chevies of the past and the present. From those he picked two to be his favorite, and the style seen in those two cars was going to reflect in his own Custom. The two inspiration cars were; The Barris Customs created Larry Ernst 1951 Chevy Hard Top (first version), and the 1952 Chevy Convertible created for Leo Welmas. 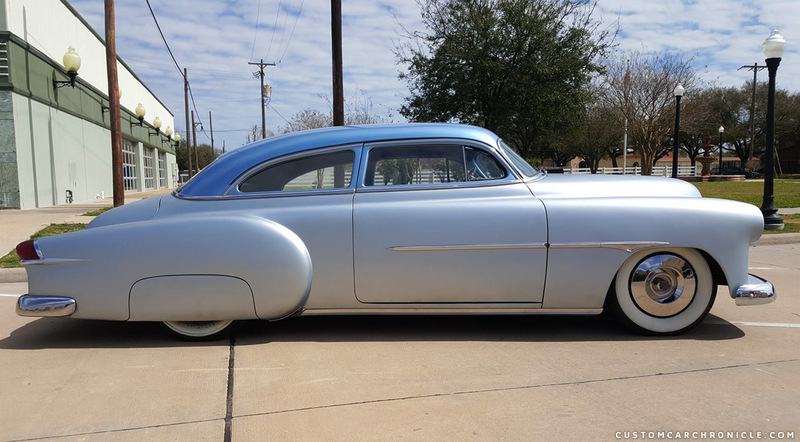 Inspiration for Sam’s 1952 Chevy custom came from many 1950’s restyled Chevy’s, but two of those stood out and became the main inspiration for the Lone Star Deluxe. The Barris created Larry Ernst Hard-Top and the Leon Welmas convertible. Both subtle yet well designed classic customs. What Sam liked so much about these two classic Chevy Customs was that both had major body modifications, yet both were still very subtle in their overall appearance. That was exactly what Sam had in mind for his own Custom. The end result he was looking for would be subtle, something that would not “Stand Out” in the car show per say. He was rather looking for a car that people would pass, and then turn back to see why this car was looking so good. Then realizing all the details and delicate body modifications that were done to the car to create the “just right” effect. Before Sam actually started to work on his car he discussed all options with his friends, making sure he would make the right decisions in the the style and feel he was looking for. The rear fenders/quarter panels were extended 3 inches to make the 1954 Packard taillights work with the Chevy body at their best. 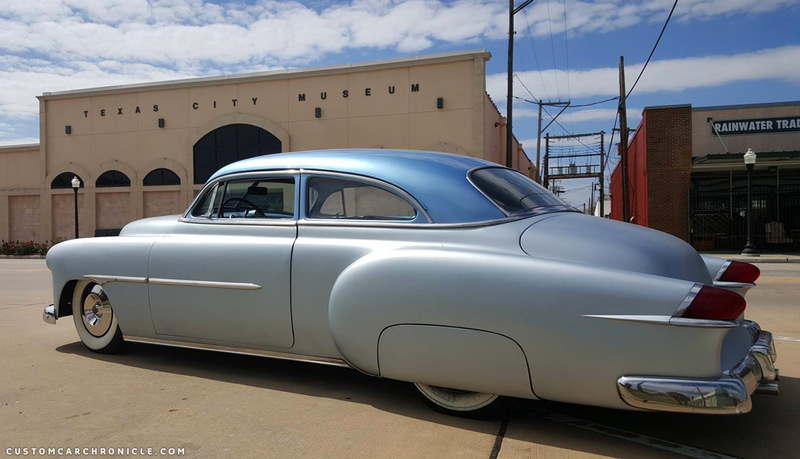 The ’51 Packard side trim was places so that the spear would optical flow with the peak on the rear fenders from the Packard taillights. The extended down flush fitting fender skirt help with the overall flow of the car. Sam and some of the CoChinos club members started the work with taking the body completely back to bare metal to make sure the base was at its best. Work started with replacing the rusted areas with new patch panels including the floor and then it was time for the more fun stuff…. the customizing. Sam had collected some parts that he wanted to use on his dream customs. 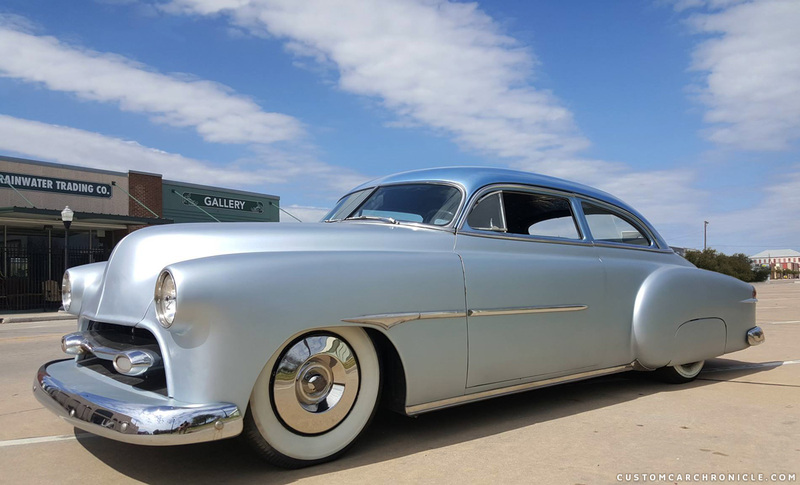 1951 Packard side trim, 1954 Oldsmobile grill, 1954 Packard taillights, 1953 Cadillac Sombrero hubcaps, 1952 Ford headlights, 1950 Pontiac rear bumper, Firestone wide white wall tires, etc. First on the agenda was to get the car at the desired ride height. 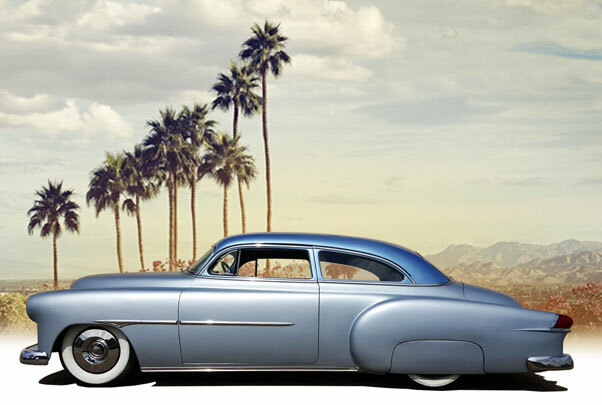 Sam wanted his car to be low and about level, typical for the look of the early 1950’s customs. Chassis Engineering products were used for the independent front suspension as well as the springs in the back. A Gambino Notch Kit was used at the back to get the car as low as Sam wanted it to be. 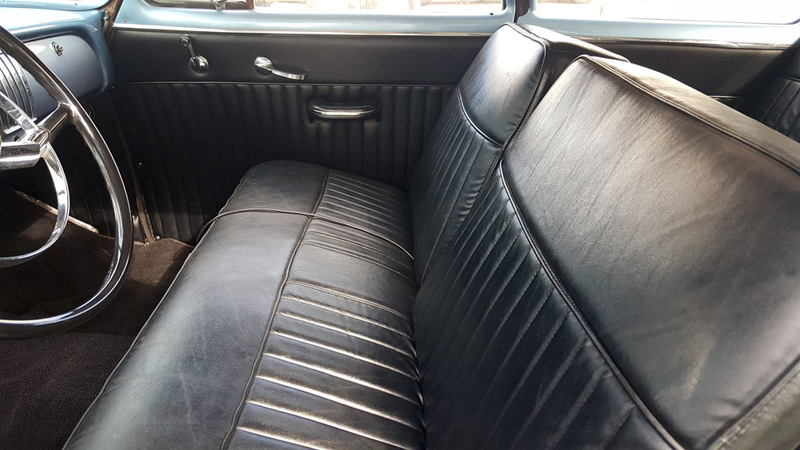 They also installed two air shocks and a compressor, allowing for a slightly higher stance for highway speeds and when family and friends take place in the back seats. When the car sat right it was time to graft the Packard taillights in. Club-mebers Ivan and Adrian extended the rear fenders about 3 inches and shaped new sheet metal to make the Packard taillights flow with the Chevy fenders. The 1952 Ford headlights were welded to the front fenders. The door and trunk handles were shaved and the hood was made into one piece. The splash-pan front and rear was reshaped and extended where needed. 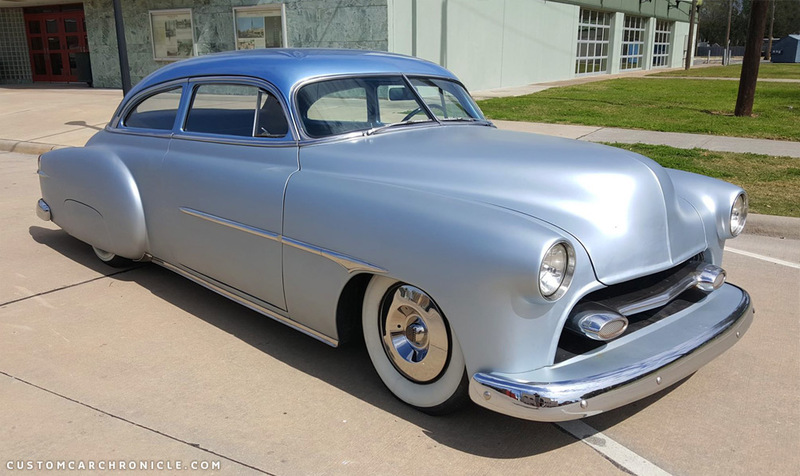 The front bumper was replaced with a “California Seamless” Chevy unit, and the rear bumper was replaced with an 1950 Pontiac bumper which wrapped around the extended rear fenders much nicer as the stock Chevy unit. 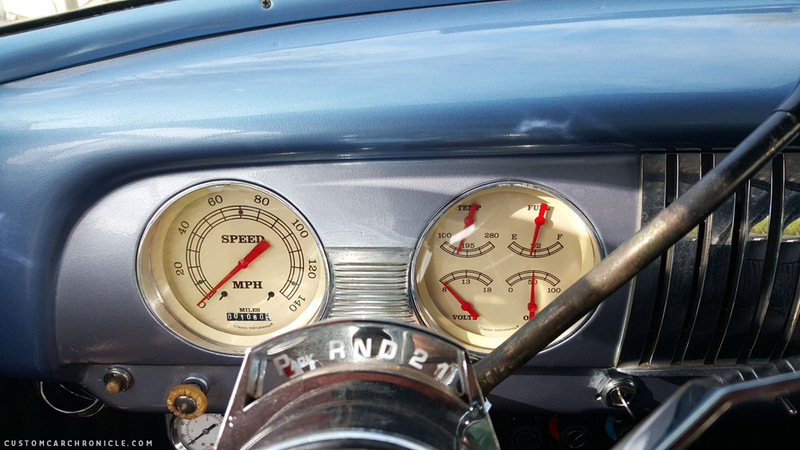 The dash was cleaned up and the gauges replaced with new classic instrument units. A better look at the off-white with red needles instruments. Then it was time to get really serious and start with the Chop. Sam wanted to have a really smooth chop, not overdone, just very elegant, complementing the great lines of the car. 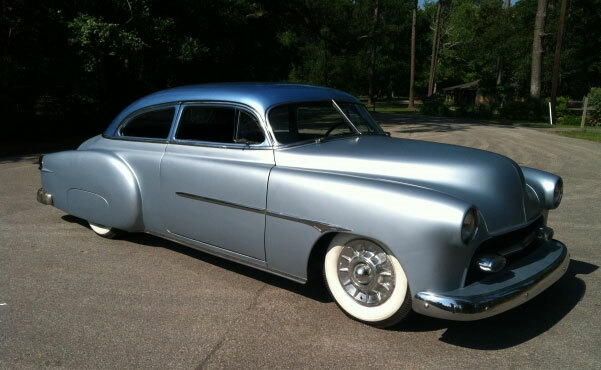 He also wanted to keep the top and rear quarter windows full length, and the catwalk the original size. Sam handed the car over to the capable hands of Sean Ornduff of Ornduff Craftsmanship in Tomball, Texas for the chop and fine tuning of all the body work. Sean chopped the top approximately 3 3/4″ in the front around 4″ in rear. The front was measured, but the rear was just cut down till it looked just right. A lot of time was spend on the flow of the rear of the top and how the rear window fits both the shape of the new top as well as to the belt-line trim. The B-pillars were leaned forward slightly for the right effect. 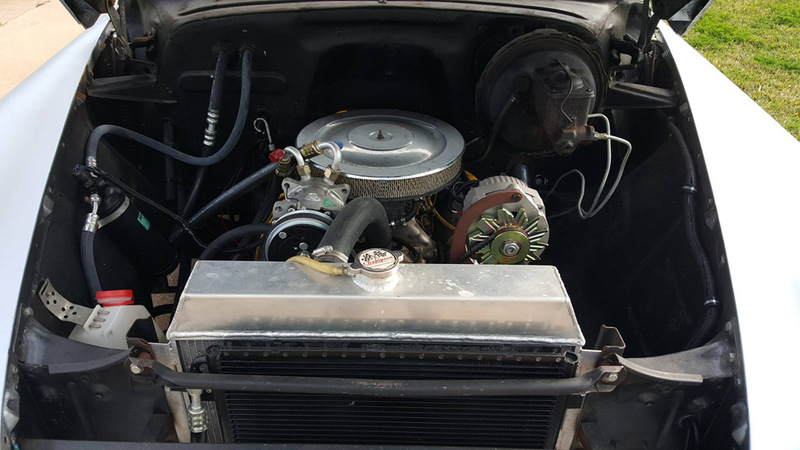 Sean also created the new grill opening from shaped metal, and modified the 1954 Oldsmobile grill bar to flow with the grill opening shape and to make it fit just perfect. The idea was to have the car on the road semi finished for some time and then fine tune everything for an ultimate early 1950’s paint job. So the body work on the main body was semi-fine tuned by Sean. The top was completely body worked and then the whole car prepped for paint. Sam was very impressed with Sean’s work and attention to detail and style. So he let Sean decide on the colors for the Chevy. Sean picked a beautiful medium blue metallic for the top and tinted primer for the main body. The top was clear coated gloss, but the main body was coated with flat clear for a really special look. 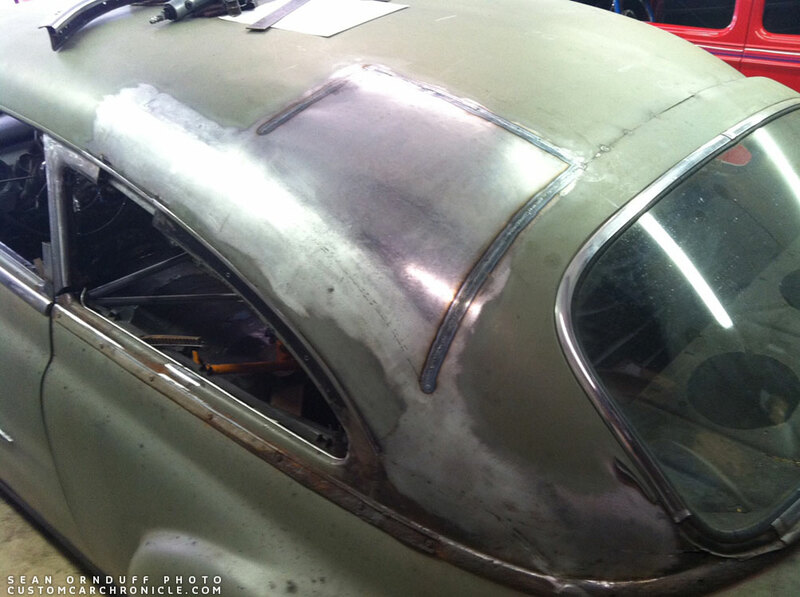 Sean also took care of modifying all the stainless trim on the car including modifying the Packard trim. Sam wanted to have all the glass on his Chevy to be real glass, so extra care was taken at all the window openings. The stainless trim was painstakingly modified to work with the new lower windows, the garnish moldings were reshaped to fit. 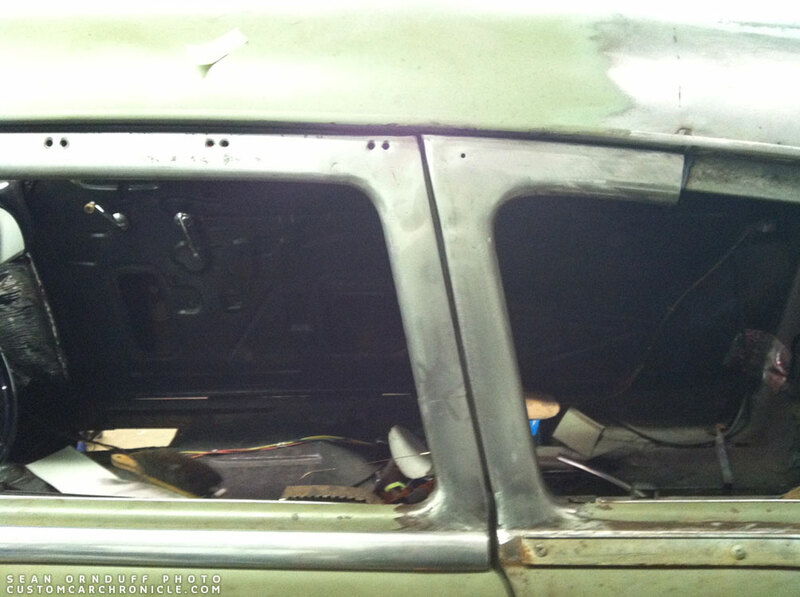 Sean made sure that the door and rear quarter windows are fully functional. The original plan was to drive the car like this for a couple of years, so Sam did not want to go all wild on the interior either. 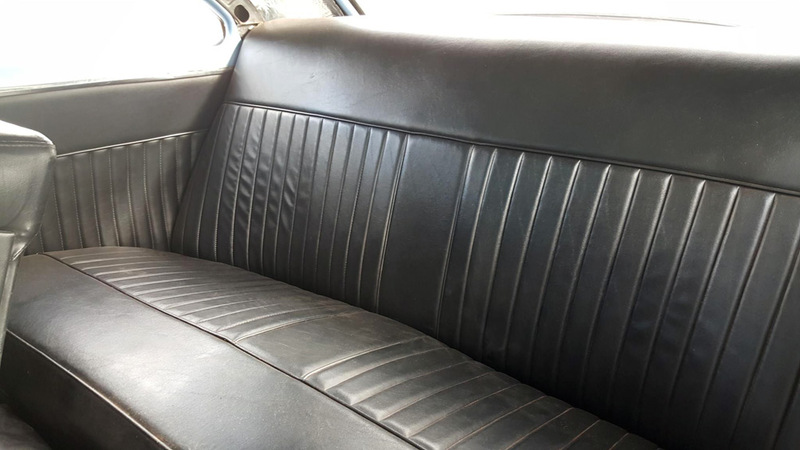 The stock interior remained in the car, but was redone in marine vinyl. The interior was just perfect for the driver the car has been for the past 5 years. But the plan always was to go for an really nice two tone typical early 1950’s interior eventually. The whole interior and trunk was insulated. But so far Sam had never gotten around to actually do the upholstery of the trunk. 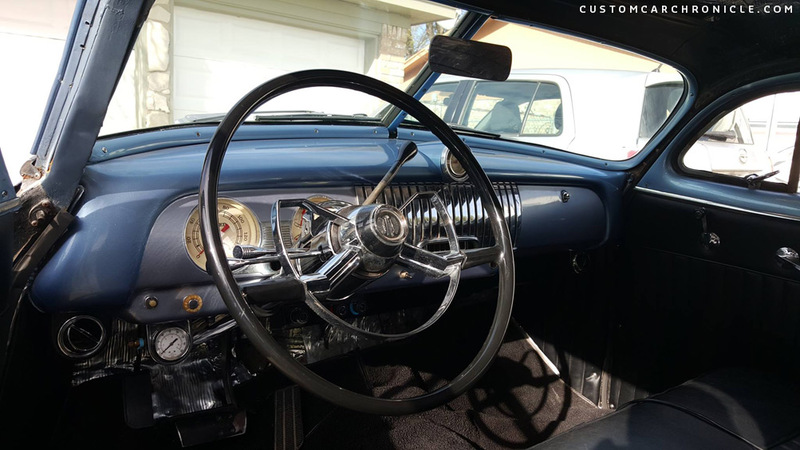 When the whole car was put back together Sam could step back, and look at his dream Custom. Everything worked just the way he had envisioned it all his time spending doing research and careful planning had paid off. There was only one small thing not quite right. When the car was first put together Sam used a set of 1957 Cadillac hubcaps which he liked very much. But they just seam to be a bit to busy, and not in style with the rest of the car. 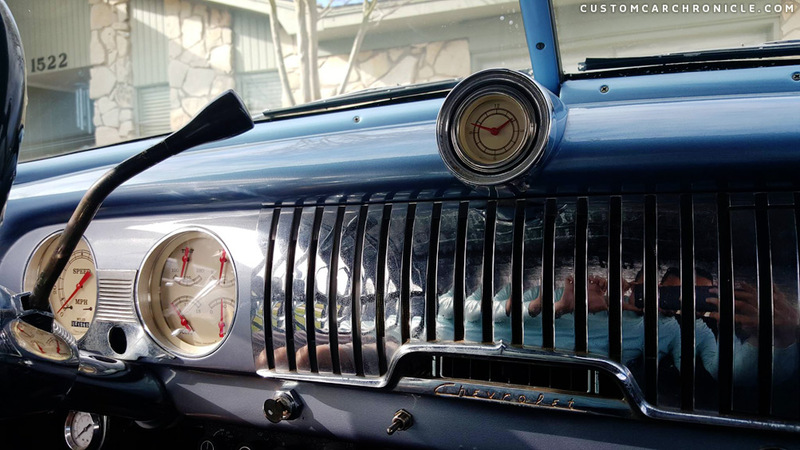 When he later replaced them with a set of smooth 1953 Caddy units it all felt in place. Sam’s 1952 Chevy had excactly that right classic early/mid 1950’s Californian Custom Car feeling he had been looking for. The amazing thing about Sam’s Chevy is that it looks good no matter from what angle you look at it. The low stance combined with extended front and rear fenders and ultra smooth chopped top make this car look so long and sleek. Sam was extremely happy with the end result…. Especially since this was his first ever Custom he created. Mission accomplished! 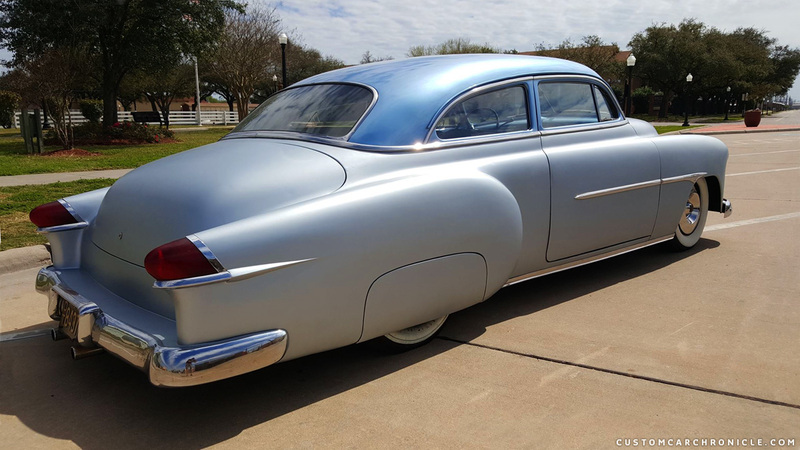 The first version of Sam’s The Lone Star Deluxe used a set of 1957 Cadillac hubcaps… nice, but to new and busy looking for the smooth 1954 style he was looking for. So he replaced them for 1953 Cadillac hubcaps. The smooth, restraint chop is perfect in balance with the rest of the body and the amount of lowering. The balance between the front and rear side glass is also as good as it gets. Especially the rear quarter view of Sam’s car give the impression of going 50 miles an hour standing still. A better look at how the Oldsmobile grill was v-ed to match the hood. Notice the delicate round corners on the front of the hood. 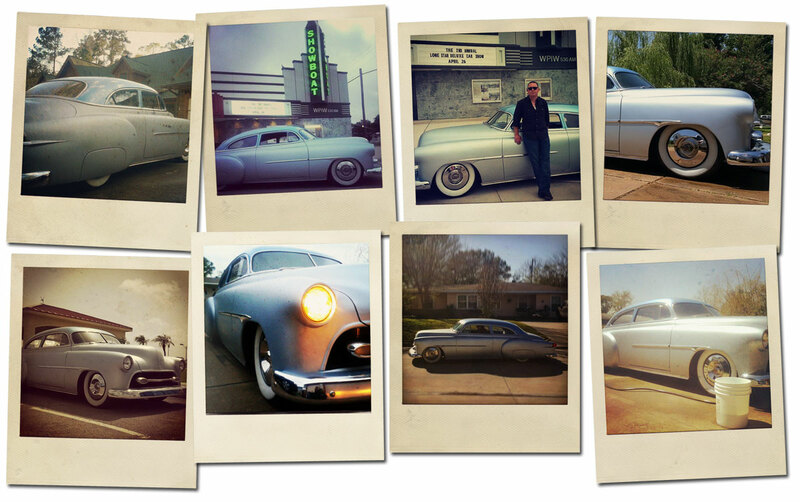 Sam has enjoyed his 1952 Chevy “the Lone Star Deluxe” for around 5 years. And even though the original plan was to have the car completely finished with period perfect glossy paint and full 50’s style all new interior. Sam has decided that it is time to let go of the car. This was Sam’s very first Custom Car project, and in the last 5 years, many new Custom Car dream projects have been planned in his mind. So the Lone Start Deluxe is for sale… to find a new home for it. And time for Sam to move on to his next Custom Car venture. The car is located in Texas City, Texas. Chop- Approximately 3 3/4″ front and 4″ in rear by Sean Ornduff of Ornduff Craftsmanship, new window seals and felts installed. All windows are real glass, and fully functional with garnish moldings installed. ’54 Packard Tail Lights. Started by Ivan and Adrian from Los CoChinos Car Club and finished by Sean Ornduff. New splash pan was installed to accommodate the extension. 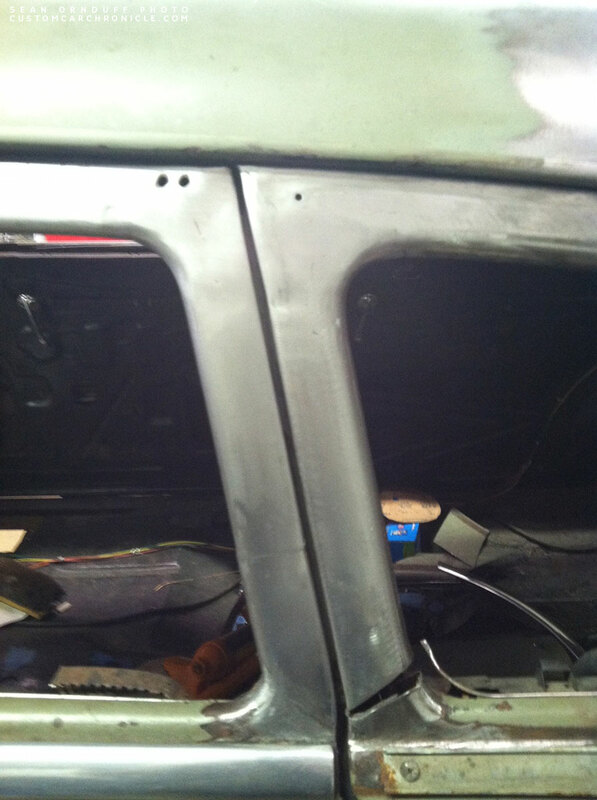 Fender skirts were extended to fit flush to body at the bottom. 1952 Ford headlights molded to the fenders. Front bumper is new “California Seamless” Chevy unit. ’50 Pontiac rear bumper with modified ’49 Chevy license plate guard. Hood peaked with one off grill opening by Sean Ornduff. 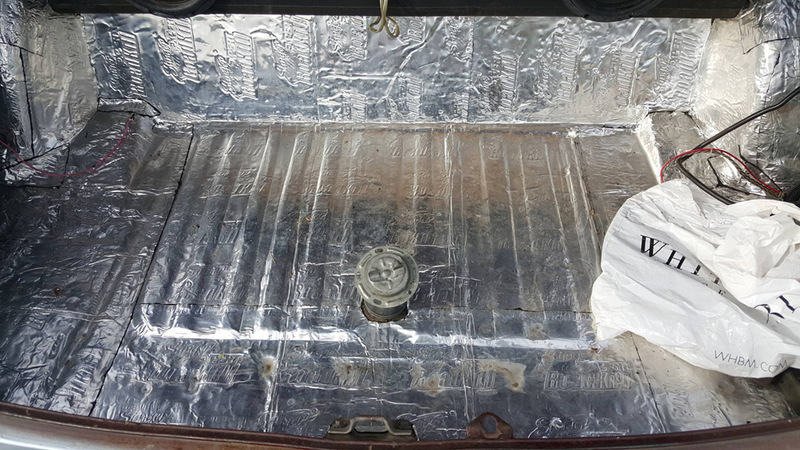 Floor, trunk and roof have been insulated “Road Kill” insulation similar to Dynamat. New chrome tilt steering column. Roof has been body worked and painted 100% by Sean Ornduff. Body has been lightly body worked and has a flat primer with flat clear over it. Rear end- 308 ratio out of a 1969 Camaro. Front: Chassis Engineering independent front suspension with disc brakes purchased new and installed with motor and trans. Rear: Chassis Engineering “Lowrider Springs” with two air shocks and compressor for highway speeds and when passengers are in the back seats or heavy weight in the trunk. Step Notch: Gambino Notch Kit. Wiring: New “EZ Wire” harness installed by White Wall Garage in October 2015. Vintage Air 2nd Generation unit with Air Condition, Heat and Defrost installed by White Wall Garage in April 2015. 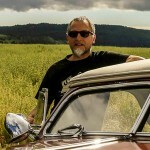 Gauge Cluster- New Classic Instruments. Mustang gas tank with new sending unit. The early stages. On the left is how the car looked when Sam bought it. On the right shows the car after Sam owned it for some time, and the work on it was progressing bit by bit. The 1951 Pontiac rear bumper was the latest addition. Installation of the Packard taillights and the first coats of primer allowing the car to be a driver before the chop was tackled. Suspension and drive-train work progress on the Chevy. Sean’s work on the C-Pillar and rear of the top to make sure everything flows right. Canting the B-Pillars forward in-progress. More work done on the B-Pillars, lengthening of the rear quarter window still needs to be done in this photo. I love this one! As Rik points out, a lot of thought has gone into how the lines all flow together, using parts available back in the day. The Packard trim flowing from the front wheel opening does direct the eye to the nicely adapted 54 Packard tail lights. And that chop is dead on! The Lone Star Deluxe is an example of understated elegance. Balance and restraint was used well in this classical build. 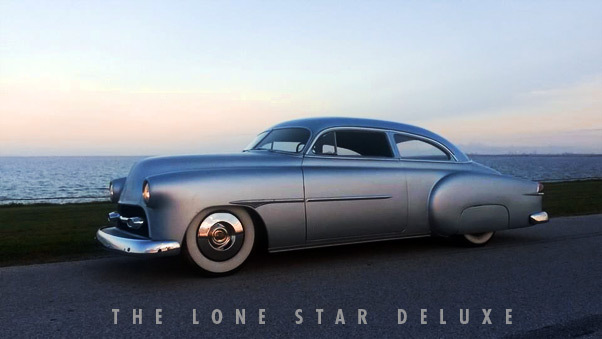 The Lone Star Deluxe is an absolute beauty, thankfully thought out, and finished with a certain elegance.